Give Mom the gift of a relaxing afternoon tea time. 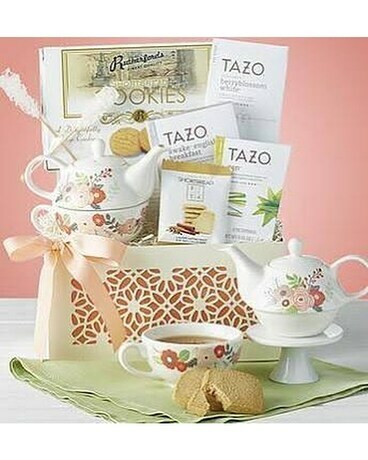 She'll adore the lovely geo-floral design keepsake basket filled with tea time necessities including a beautiful stoneware "tea for one" tea pot & cup set and sugar stir sticks. A trio of teas from renowned Tazo® are perfect with the Biscottea® Chai Tea Shortbread and Eurostyle Biscuits. Attractively tied with a peach gros grain ribbon.